March 30, 2015  In a strongly worded essay in The New England Journal of Medicine, the philanthropist calls for a global system to respond to future medical emergencies. 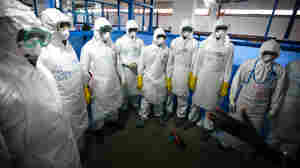 We ask experienced Ebola hands to weigh in. January 23, 2015  Their annual letter to the public has been published. They're betting that in 15 years, polio will be eradicated, Africa will feed itself and 2 billion people will use their phones as mobile banks. January 8, 2015  From stylized photography that looks like a fashion shoot to a comic book journey about lockjaw, artwork from around the world illustrates the value of vaccines. The Ice Bucket Challenge And Other Good Causes: Do Stars Really Help? August 20, 2014  When actor Tom Hiddleston and Lady Gaga take the Ice Bucket Challenge, it makes a big splash. But do stars really make a difference in fund-raising and public awareness when they endorse a charity? April 24, 2014  The Microsoft founder and philanthropist talks with NPR's David Greene about why he's spent billions on health efforts in developing countries, and about the prospect of beating polio and malaria. February 4, 2014  Satya Nadella has been with Microsoft since 1992. Most recently, he led the company's "cloud and enterprise" group. Bill Gates, Microsoft's co-founder, will no longer be the company's chairman. He's going to be a "technology adviser" to Nadella. 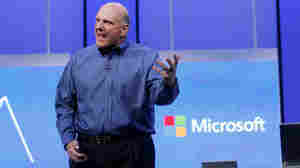 January 31, 2014  CEO Steve Ballmer announced last summer that he would be retiring. The search for a successor may be coming to an end. 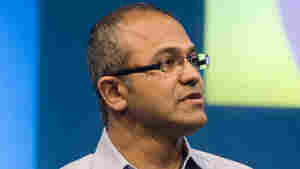 News outlets report that one of Microsoft's executive vice presidents is in line to take over. 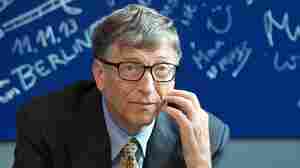 There's also word that co-founder Bill Gates may be replaced as chairman of the company's board. January 22, 2014  In his annual letter about the work of his foundation, the Microsoft co-founder says once-impoverished nations have already made tremendous progress, and more will follow their lead. November 21, 2013  What would it take for people to like using condoms? Inventors say it's all about the fit and feel. The 11 winners in a competition sponsored by the Bill & Melinda Gates Foundation include one condom made from beef tendons, and another that's heat-activated for a glove-like fit. September 27, 2013  Microsoft's co-founder wishes Windows PCs had been given one start-up key instead of the famous three-key combination. 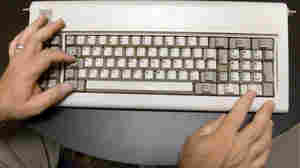 But fans are both nostalgic about what was required and say it helped protect their PCs from some problems. September 16, 2013  Oracle CEO Larry Ellison ranks No. 3 and the Koch brothers jointly occupy the No. 4 spot on the list of the wealthiest Americans. August 23, 2013  Steve Ballmer became the company's CEO in January 2000. 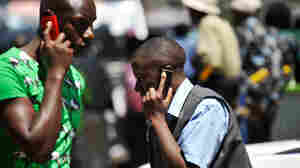 In recent years, Microsoft has come under increasing criticism for not keeping up with the shift to mobile phones. May 8, 2013  The Microsoft founder and philanthropist is putting his money and time where his passion is: eradicating polio. Gates talks with NPR's Robert Siegel about why it makes sense to spend an estimated $5.5 billion to wipe out the disease once and for all. April 23, 2013  Microsoft founder Bill Gates met with South Korean President Park Geun-hye Monday, to discuss nuclear energy and other topics. But the handshake they shared created the biggest stir in Korean society, after Gates greeted Park with a smile — and his left hand jammed into his pants pocket. 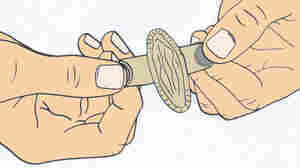 March 25, 2013  Condoms have evolved little since latex ones were first manufactured in the 1920s. Bill Gates is hoping to change that. His foundation is giving $100,000 to anyone who can come up with a condom that men or women actually want to wear.